Cholesterol is a type of lipid in the blood. High cholesterol is an abnormally high level of cholesterol in the blood. Low density lipoproteins (LDL) — causes build up of cholesterol and other fats in the blood vessels. Known as bad cholesterol because high levels can cause disease in the arteries and heart disease. High density lipoproteins (HDL) — can remove cholesterol and other fats from the blood. Known as good cholesterol because it may protect against heart disease. This type is caused by inherited genes. These genes cause the stomach and intestines to absorb too much iron. It is the most common genetic disorder in the United States. A heart murmur is an abnormal sound made by turbulent blood flow in the heart. It sounds like whooshing or swishing with each heartbeat. 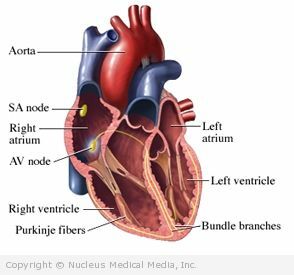 Some adults and many children have incidental heart murmurs that are harmless (benign) and are not caused by abnormalities in the heart. At least 30% of children may have an innocent heart murmur at some point during childhood. However, some heart murmurs can signal an underlying heart problem.